When they used to look at all the intricate mechanical parts and gears as they watched over people assembling the iconic Leica cameras, they would comment that these craftsmen would probably easily be able to make watches as well. 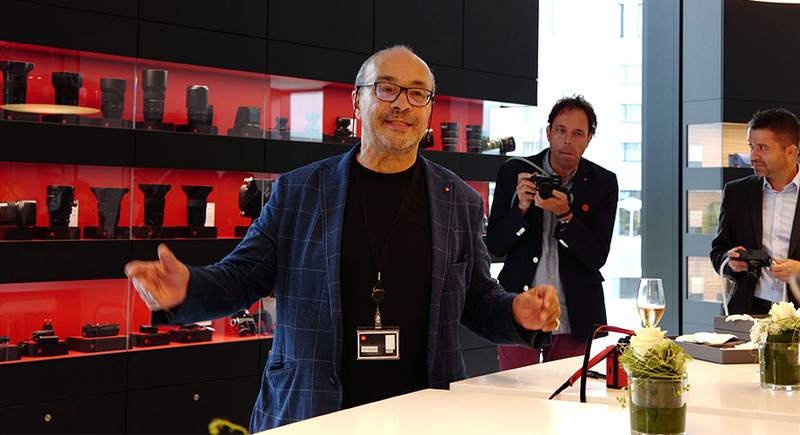 That was the story that Leica Chairman Dr. Andreas Kaufmann told my son at breakfast when asked why the camera maker decided to make timepieces. There was more to it than that, of course, the big boss explained. But generally they saw synergies not just of technologies and skills but also of passions and enthusiasms and prides and even markets and consumers. A small group of people stood around a desktop the night before as Dr. Kaufmann presented the company’s new wristwatches to the world. 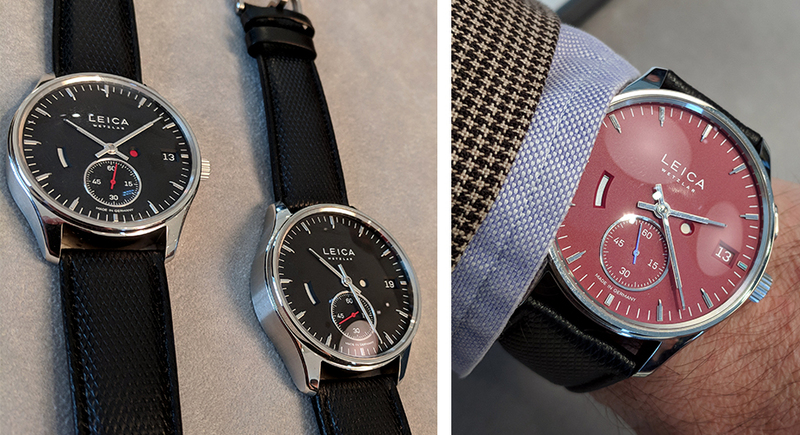 Two different models, each in two different dial colors, were shown as the Leica Chairman of the Board personally explained what they were doing and why. This particular watch project is not the first for the brand, or even the second. Many people remember the most recent watch to bear the Leica name, a rather complicated affair in collaboration with watch company Valbray. Prior to that though there were other timepieces, and Dr. Kaufmann presented examples of those as well. They ranged from very simple and classic to the somewhat conversation-generating Valbray collaboration with its working aperture. This time they’re going big time. Can’t just slap in a Miyota and call it ours, he said. They wanted to bring something truly unique into the world. And they did it the hard way. Their watchmaking partner in this endeavor is the Black Forest-based Lehmann LEHMANN PRÄZISION GmbH located in Schramberg. This may sound familiar to some Germany-market watch enthusiasts. Schramberg is the home to watch company Junghans. Besides which, it is the parent company to Lehmann Uhren, which makes watches primarily for the Germany market that bear the name Lehmann Schramberg. So very clearly, Leica and Dr. Kaufmann wanted to keep everything “Made in Germany.” This direction was evident even before these actual pieces were designed (by Professor Achim Heine, by the way, who oversaw many Leica camera designs over the years). The journey brought them to speak with many other German companies and watch-making personalities and even brought them into discussions of corporate purchases. 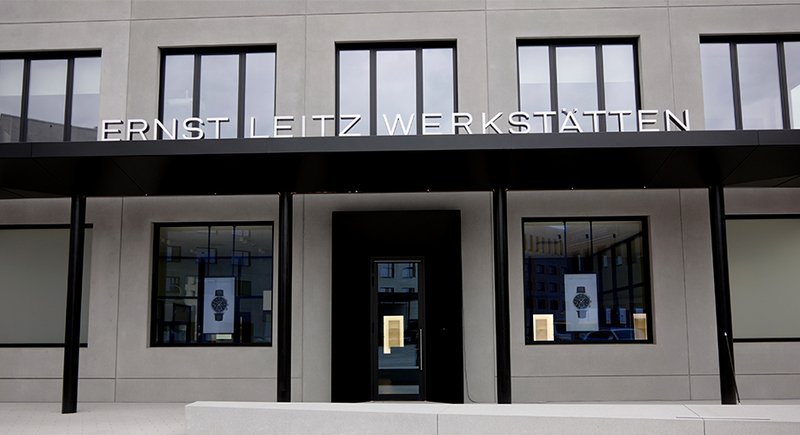 The watches themselves are assembled in the Ernst Leitz Werkstatten, a name with some history in the company that is now housed in its own building in the recently-inaugurated expansion in the Leitz Park in Wetzlar, Germany. This is where, as Dr. Kaufmann explains, the final “marriage” of the components will take place. 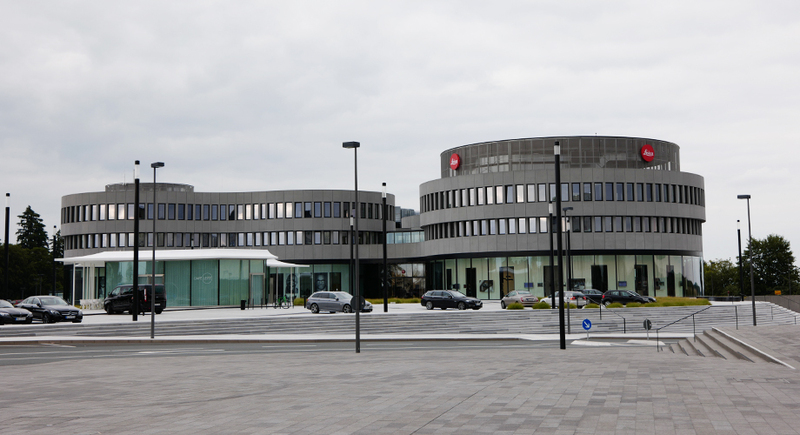 Primary production of components will be done in the Black Forest with LEHMANN PRÄZISION. 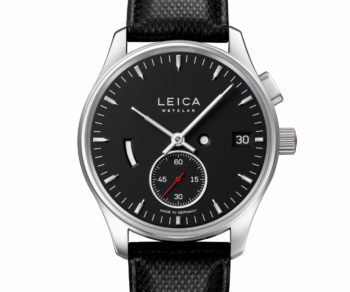 The two pieces presented were the Leica L1 and the Leica L2; this design is classic and tight, with elements that nod to the details that are well-known to those who collect their cameras. 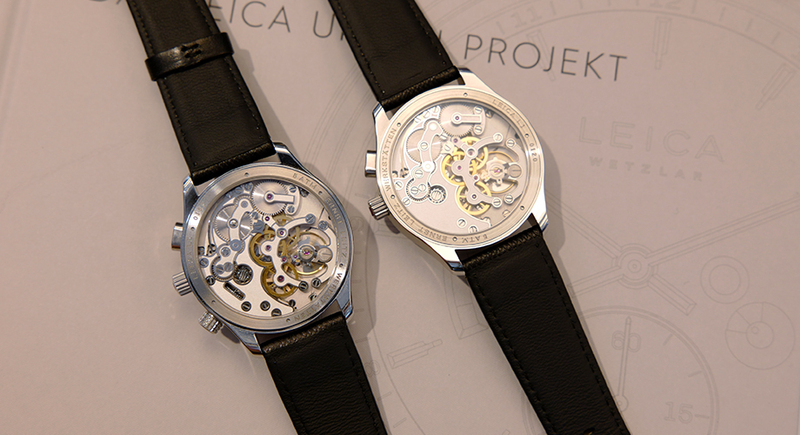 The movements of both are mechanical with manual winding, and these “Made in Germany” Calibres can be viewed thanks to a sapphire crystal caseback. Watch enthusiasts immediately noted the distinct look and aesthetic feel of the movement, and asked specifically about which and how many finishing types were used. That was something they have to ask the watchmakers, they said with a smile. Some of which, by the way, had experience in other areas besides Schramberg. Such as Glashütte. 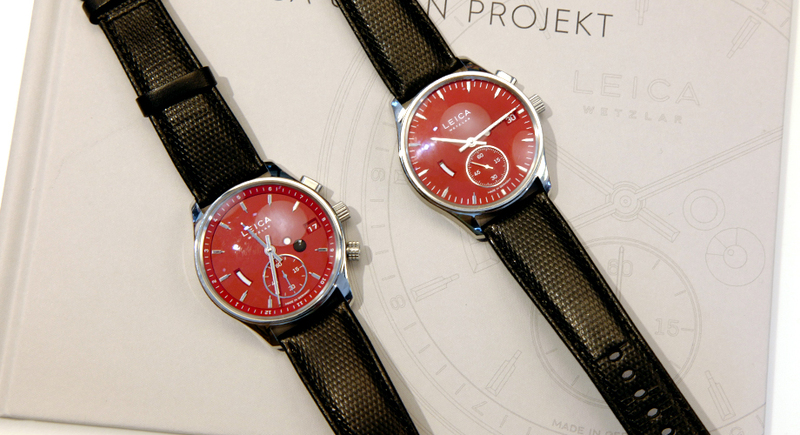 Both watches were presented with a black and a red (very nice, think Leica) dial, in stainless steel cases. They have two central hands for minutes and hours, with a seconds hand at 6 o’clock. There is a date window at 9 o’clock, a long power-reserve aperture between 8 and 9 o’clock, and an aperture just to the right of central that is either red or white. If you push the crown, you reset the seconds hand to zero and are able to set the time. This is indicated by that round aperture turning Leica Red. When you are done, you push it again and the aperture becomes white and the movement returns to standard running. Date adjustment has a separate dedicated pushbutton at 2 o’clock. 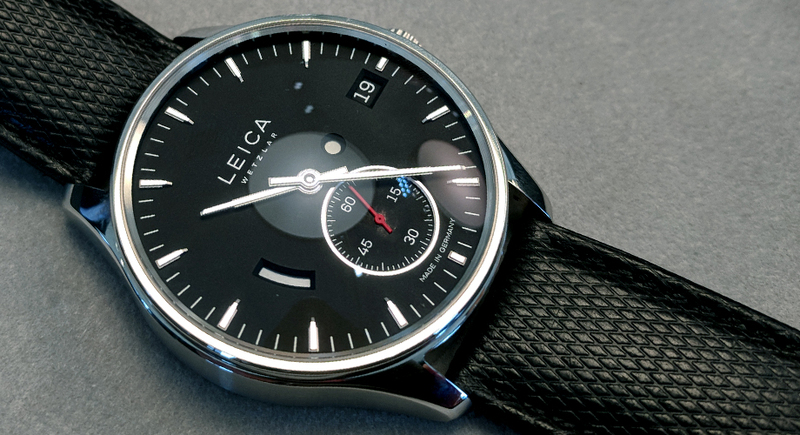 The L2 model has another crown (knurled in a different way) that is used to turn the internal bezel in a way that allows you to align the indicating numbers and have a functional second time zone (no additional hands though). The L2 also has yet another aperture that serves as a day/night indicator. Further plans include a case of rose gold and an alarm function. Availability will be dependent on production, which will not be large. These are their first serious timepieces, and they are still learning their way around. As we said, when we asked about finishing processes they told us that listing those down was one of those things they haven’t gotten around to yet. But this is a serious and historied company with an independent mind and strong leadership. They are going down a path they have tried before, but are now trying with much more direction and determination. All the watches we saw were working pieces, but they were all in a form that could change as they learn as they go. Dr. Kaufmann saw the Calibre x Horology Matters Bronze prototype on our wrist, and asked about it. We said it was the prototype, and showed him the mistakes. The good Doctor smiled and said, Oh yes, I’ve learned a lot about the process of watch prototypes lately. 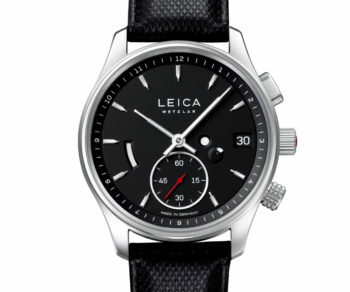 The watches will start to be available within the year at selected Leica boutiques, certain German watch shops and the Ernst Leitz Werkstatten showroom in Wetzlar, Germany.